Retiring from my Etsy shop on 5/6/11. Free shipping on these 3 pieces. What makes a blog ‘successful’ and how is success even defined? Why do some blogs seem to get all the attention, visitors, and comments while others don’t? Should an artist’s blog be devoted to art, to personal issues, or perhaps a combination of both? Can a post have too many words or not enough pictures? How can I get a bigger audience and should I even care about that? Should I pay attention to the number of hits I get and all those other stats? Will my readers come back if I take a break or change the style of my art? Is anybody even reading what I write? If you have a blog or have thought about starting one and have ever asked yourself questions like these, then 'Your Blog, Your Way' is for you. Join me here on Create Mixed Media for my first post in a series that explores what it is to be an art blogger today. I had the pleasure last week to be interviewed by Mark Lipinski on Creative Mojo, an Internet radio show. Mark is the Creative Director for All American Crafts publishing and the mastermind behind so many of the craft magazines that you see on the racks at Barnes and Noble and other newsstands. 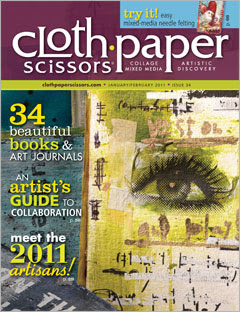 He is also known as the 'bad boy' of quilting and has quite an irreverent and exuberant personality. If you are already familiar with him, you know what I'm talking about! Mark had seen 'Self Contained', my project with Vivian Bonder and Stephanie McAtee in the January/February issue of Cloth Paper Scissors. He wanted to discuss more about the project and about collaborating in general. The interview was live on Wednesday 4/20 but you can hear it as a podcast available for download in iTunes or, more simply, at this link. Just scroll down and click on the 4/20/11 show. Creative Mojo is two hours long but you can find my segment between 37:30 and 59:00. Thanks Mark for the opportunity. It was a great experience. I just received a copy of the new brochure from the Printmaking Center of New Jersey. Two of my handmade books had been part of an exhibit, Below the Surface, at PCNJ in 2009. I was excited to see that one of the pages from my book Billboard was used as an image in the brochure. If you are not familiar with PCNJ, please take a moment to visit their site. They offer workshops, rent studio time, hold exhibitions, and provide valuable educational opportunities to children as well. Whenever I travel, I like to create a visual journal that acts as a repository for all my memories; a book that I can flip through at any time and be brought right back into the thick of the adventure. I try to journal at some point on each day of all my trips, while the experience is fresh in my mind. You can read more about my journal-making process on Bridgette Guerzon Mills' wonderful site amanobooks in this interview from 2009. Congratulations to Jann Gougeon from ...with an artist's hand who won a copy of Surface Treatment Workshop in my giveaway. Look for more book reviews, author interviews, and giveaways when The Book Guild returns. I am a journaler. Okay, I said it. Outloud. For everybody to hear. I share most of the artwork I create and the art projects I am involved with on this blog. But one thing I have never shared before are my personal journals. I do not journal daily, weekly, or sometimes even monthly. But I do journal. And I find there are definitely times when I feel the need to journal. One of the things I like about journaling is the fact that there are no rules. I can do it my way, in my time, in my style. And because I journal with no expectation of my pages being seen, it is very freeing. My journaling style tends to be different from my art. But it reflects me nonetheless. So why am I talking about this now? It is because Create Mixed Media has started The Open Page, a group on Flickr for journalers. You can join the group, upload your journals and journal pages, and take a look at everybody elses. It is like an open door into the heart of the artist. My personal journals are always handmade. Once they are bound, I begin by painting the pages with a wash. The next step for me is to add images. In my current journal I am taking my images from an ever-growing pile of torn pages from books, magazines, newspapers, and the like. My last step is adding the journal writing itself. All the pages in my journal are at different stages, so there is something to work on no matter what I am in the mood to do. Head on over to The Open Page on Flickr. You can see more of my journal pages and add your own!